We’ve used a combination of punchy flavours, including coriander, ginger, chilli and lime, to create a zingy Asian-style pesto. 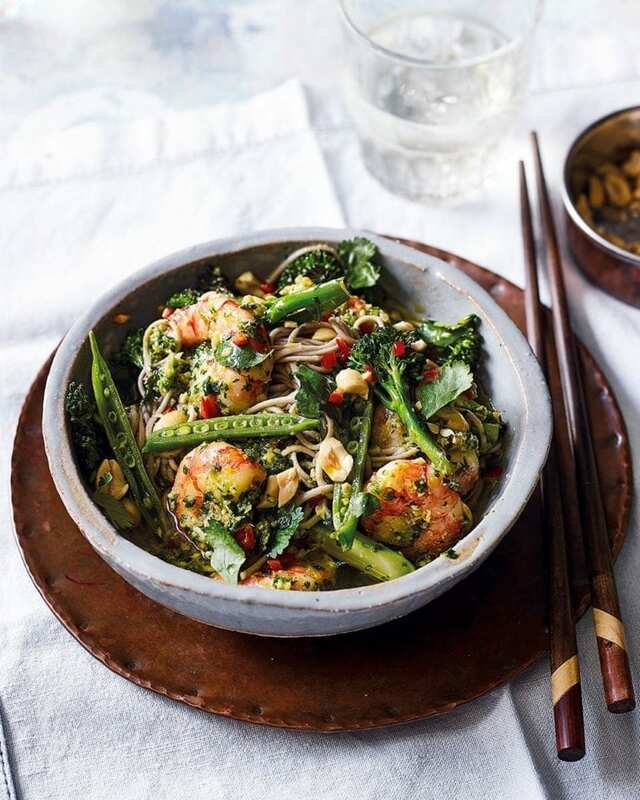 Store in the fridge to add instant flavour to midweek meals, or try it in this prawn noodle dish. It only takes 25 minutes to make! ½ lime to a rough paste. Add the 75ml oil and whizz again to combine. Cook the soba noodles according to the pack instructions, then rinse well under cold running water to cool and remove any starchy residue that would make the noodles sticky. Put in a bowl and drizzle with sesame oil, tossing to coat. Heat a large frying pan or wok with a drizzle of rapeseed oil and fry the prawns over a high heat for 2-3 minutes, turning, until pink and cooked through. Add to the noodles, then add another drizzle of rapeseed oil to the pan and stir-fry the vegetables over a high heat for 3-4 minutes or until just tender. Add to the noodles and toss everything together with the coriander pesto. Splash with soy sauce and squeeze over the juice from the remaining ½ lime. Divide among bowls and top with the extra coriander leaves, chopped peanuts and chopped chilli. Serve with extra lime wedges on the side to squeeze over. If you’re vegetarian, swap the prawns for the same quantity of tofu and fry as in the recipe. Make the salad the day before and chill, covered, until ready to eat. It would make a great packed lunch; cool the veg and prawns before tossing with the noodles. Take the soy, lime juice and garnishes in small tubs to add before eating.